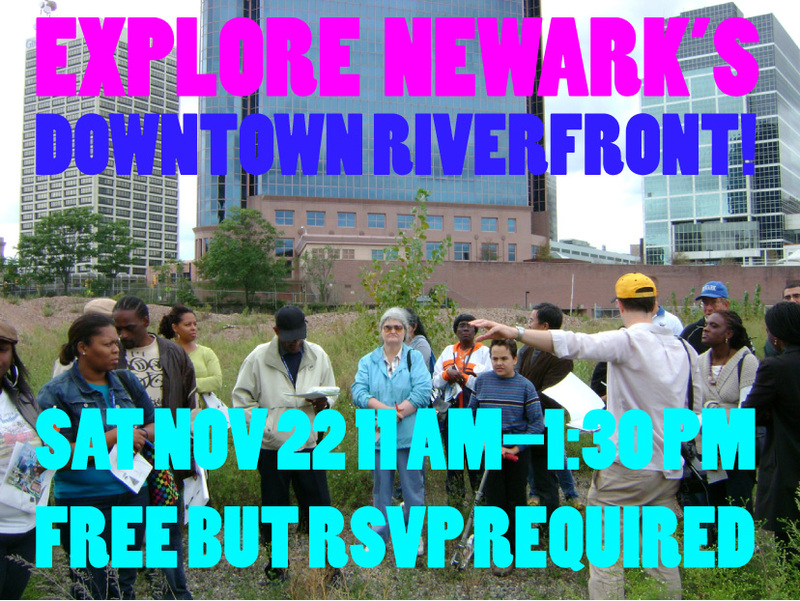 Join your neighbors for a free & fun walk along 2 miles of Newark’s downtown riverfront to discuss its history, present, and future. Free and open to the public, but RSVP required! This walk will cover two miles of the downtown riverfront between Newark Penn Station and Route 280. Examine opportunities for new riverfront parks and trails! Discuss how downtown neighborhoods can be more connected to the river! Hear stories and meet some Newarkers who have organized their neighbors to shape our community! Learn about the big debate around the Passaic Superfund cleanup! Join the movement to connect Newark to its river! Please wear comfortable clothes (pants suggested) and sturdy closed-toe shoes. You are encouraged to bring a bottle of water. 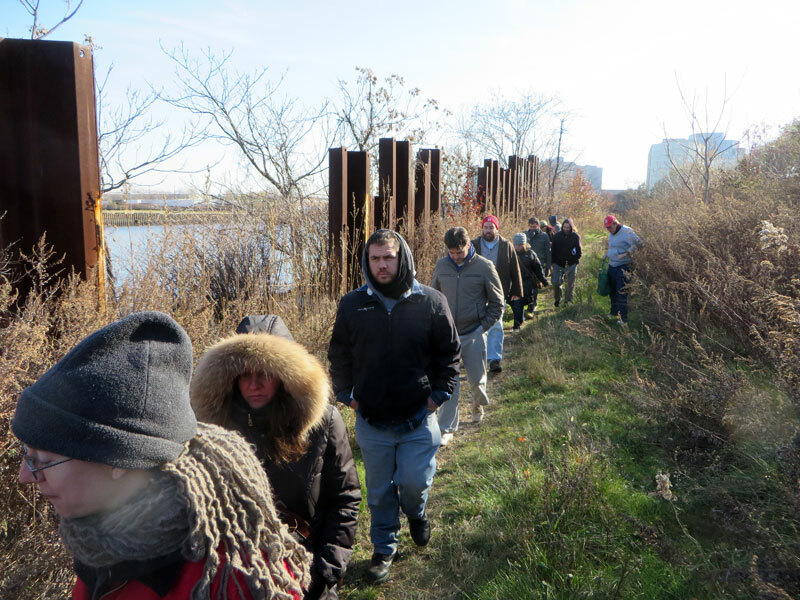 See photos of a past Downtown Riverfront Walkshop. 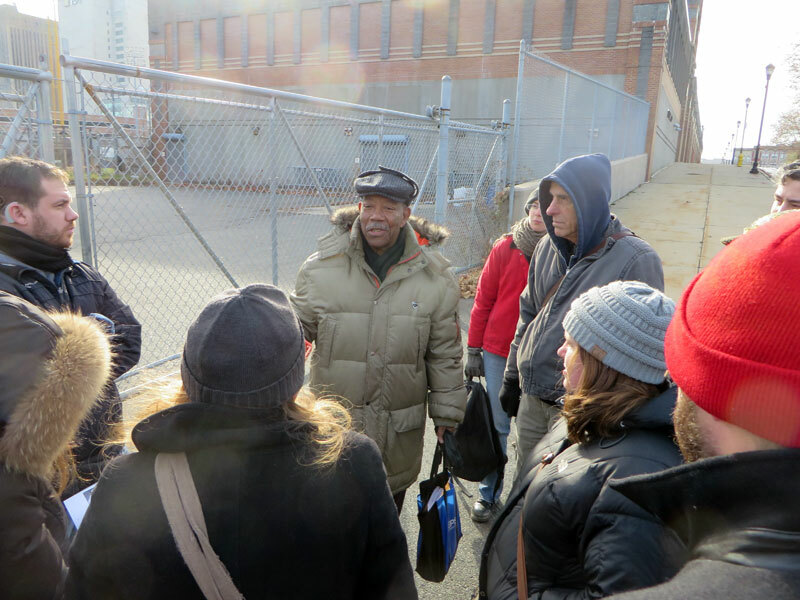 Chigozie Onyema of the Newark Parking Authority greeted the group, described the work of the Parking Authority, and discussed the potential for renovating City Dock Street alongside Newark Penn Station for parking and public access to the river. Checking out strangely placed and oriented benches along McCarter Highway, downhill from NJPAC, and talking about the potential for a future Downtown Riverfront Park. Hearing from Ironbound Community Corporation‘s Nancy Zak about 20-year struggle to create public access to and along the Passaic River. Newarkers brave the cold to inspect mysterious metal sheets near Bridge Street. Legendary Club Zanzibar photographer Vincent Bryant shares stories from when Newark invented the Jersey Sounds. Check out his book!